Looking good! 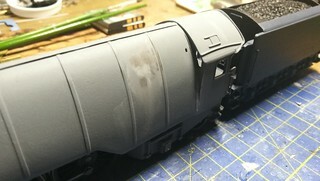 I'm dying to see an in progress photo of the whole locomotive! 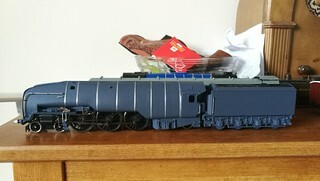 Hi Steve, yes its fitting together quite well, on to testing colours at the moment but quite happy so far, tender is pretty much done, and painted hoping when all the cash comes in from writing various things that I can finish it, I have a Z-Class to build in February for someone. But hoping to post some other bits next week, got my camera back just waiting for a new screen to arrive, just about getting by with my mobile camera. but its a struggle getting the finer details especially the small ones. 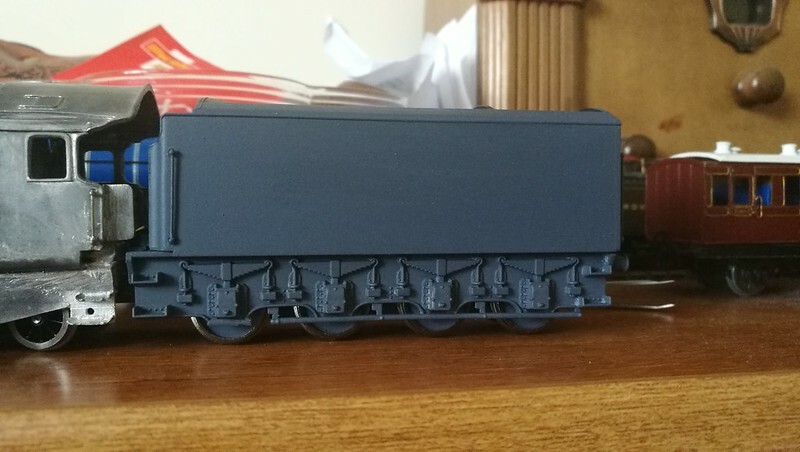 I then went back to the tender as that had a bit more work to do on it than the loco now at this point so I can catch up ready for priming and filling. 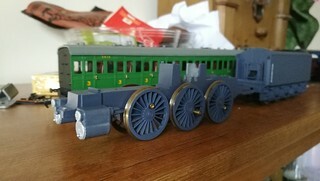 The Bachmann A4 tender is quite old, but not bad and does need some detailing and updating in some areas. I drew up some updates to add on, the lamp irons were changed to etched ones from Mainly Trains, which also adds some detail plus the tender required for the W1 required an extra lamp iron. 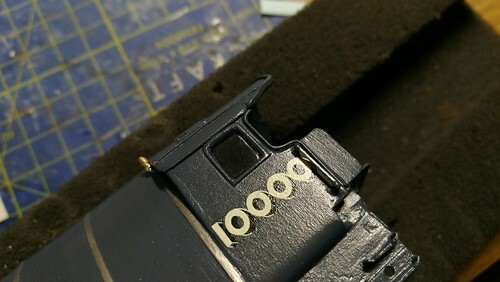 These were added to the rear and glued in position, the next part was updating the look of the corridor connector, using a piece of brass sheet I marked out and then cut out the plate for the front of the corridor connector, this was glued on the front with Araldite. 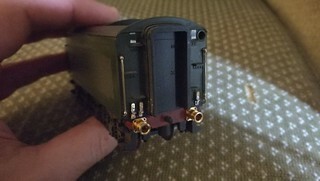 Once the glue was set, I added the hand rail that runs over the top of the corridor connector using small handrail knobs and 0.45 brass wire. 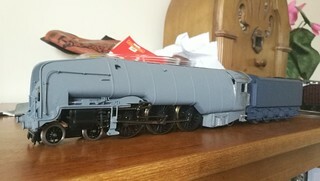 This now means the tender is complete and ready for painting, it's been quite difficult to track down Battleship grey, which may explain why some many have put a lighter grey on their models. I found a few spray cans on Amazon, but some were not deliverable to my island, so I popped in to my local model shop in Sandown and had a chat, luckily he was able to help as my search of his stock didn't come up with anything, but he managed to find a very close match in the Vallejo acrylic paints range (70.816) after trying it out I am happy it's close enough to go ahead and paint the whole model when I get round to it. Battleship? I thought it was a steam train! Indeed or another shade of grey, sequel to 50 shades of grey. 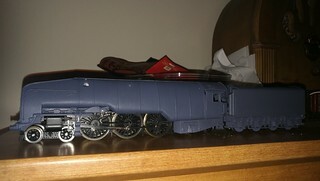 Back on the loco end, which has been finished for a while with just small items to add, I began prepping the body, giving it a good clean to get rid of any leftover flux or dirt, this was done in some soapy water and a tooth brush to clean the body off. 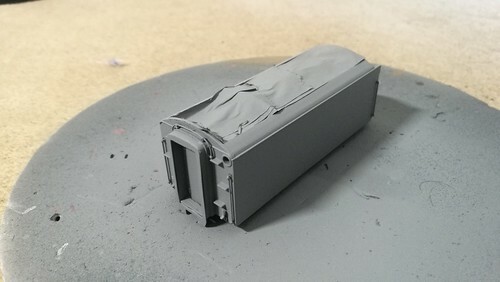 Once dry the body was primed in good old Halfords grey primer. 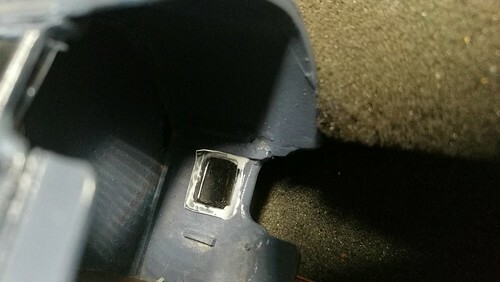 A series of thin layers were applied and in between coats, the body was checked for marks or imperfections in the surface which will then require filling, and sanding with some fine wet and dry sand paper. This was done till I was happy with the condition of the body, and as everyone knows, your finish is only as good as the prep work you do before and how prepared the surface is. The boiler bands will be scrapped off later after the painting hopefully revealing polished bands. While waiting for filler to dry I was browsing the layouts under construction on this very forum, and I wasn't fully happy with the handrails above the buffer beam being 2 brass rods with handrail knobs soldered on the end, although its holding, in the long run I feel it won't be as resilient to any knocks it may receive so as I like to browse various layouts and see what people are doing and if there is anything I can learn or gain. 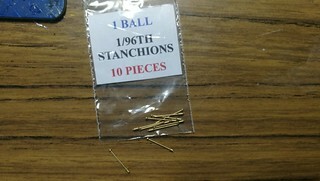 While reading Jim S-W topic of Birmingham New Street in P4 I saw some work he was doing on a water tower with some rather nice turned brass stanchions, after looking through what Modelling Timbers the company that make the turned brass stanchions I found one which just matched the measurements for the Hush-Hush, 1/96 SCALE STANCHIONS 1 ball, these arrived a few days ago a pack of 10 so plenty of spares. The old handrails were removed and the new ones soldered together and soldered in place. 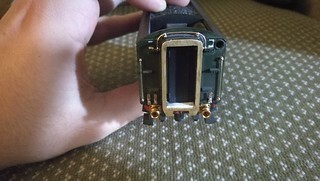 as always an excellent model due your expertise and detail. I am truly envious of the skill and passion you devote to your models. Thank you, I am self taught so if I can achieve what I can anyone can really. I have completed the model and it has been for it's test run and went well, few adjustments to make but moving in the right direction. 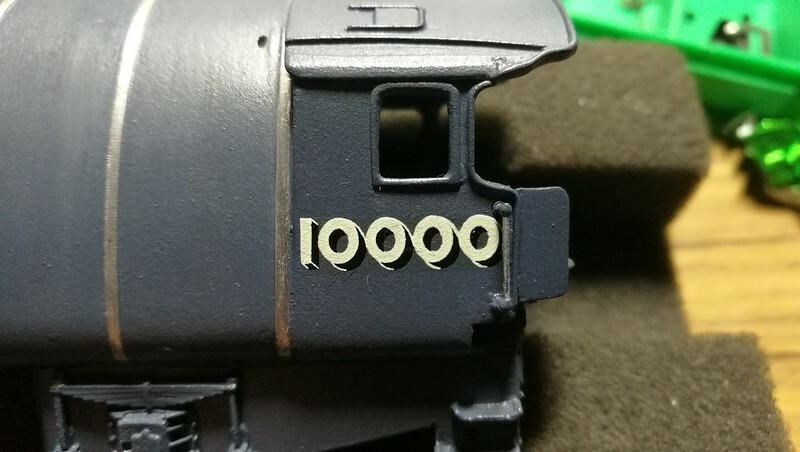 So it was on to painting the loco end of the model already having done the tender, which is nice and easy as it's pretty much all grey, adding light layers of paint I applied about 4 coats to the body. As most of you know the boiler bands are polished bare metal, the bands were then scrapped clean and were lightly sanded with very fine wet and dry sand paper, which brought them up nicely. Before varnishing there's still a few bits to paint, mainly small items, like pipe work and hand rails, these were all done with Vallejo acrylics. 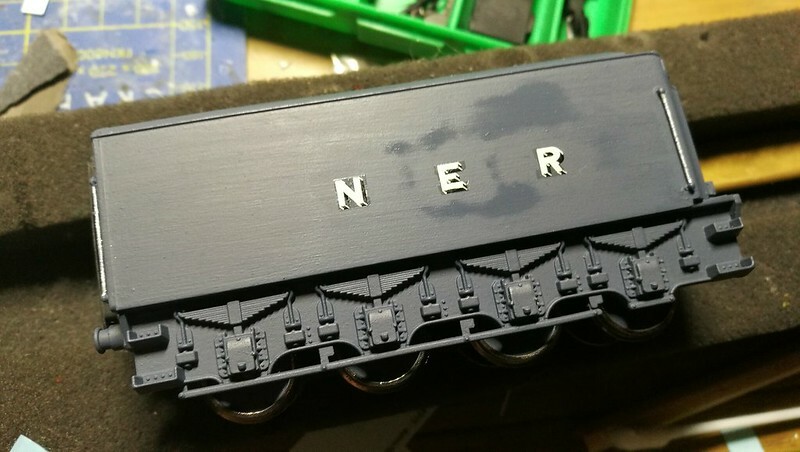 Adding the transfers to the model before the varnish was also done, the transfers for this particular model are available from Fox transfers, and are basic waterslides. On to the more technical bit of the build, the chassis and wheels are also the same colour as the loco body, so this means careful disassembly and storage of screws and parts, I have a very useful little box which came with the BRM mag last month screws and parts for the front middle and back are stored in different sections hopefully to make reassembly easier... well that's the hope. 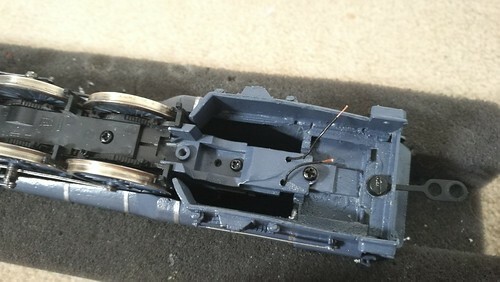 The chassis is stripped down, and de-greased as quite a lot of oil and grease does get over quite a few parts, so once the model is dry, the surface was keyed to take the primer, and then painted in the same Battleship grey which was used for the body. The wheels where hand painted and varnished using a metric circles drawing template which protects the tyre of the wheel. Cylinders were also painted with the front caps painted in silver. Prior to re-assembly you may of noticed above that the connection rods and motion are not as bright as before, I decided to try something different as I have seen it done before on others models, I used Railmatch Oily steel (415) I didn't coat the rods over fear of jamming it up, so it was a light coat to just reduce the shine on the rods, and I think it looks not too bad. 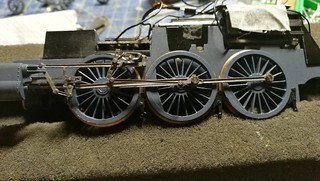 The chassis was test on my rolling road, and ran better than previously, which was encouraging, everything was oiled, lubricated in the correct oil, and was quite happy with how it went back together and how the test went, so I could proceed with adding the remaining parts back on like the front bogie and also the rear bogie which was finally wired in to the chassis. 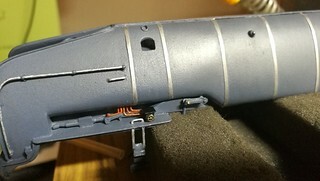 With the chassis put back together, wired, and tested, back to backs on the wheels checked, then it was on to finishing the body with its more interesting bits, the windows which have been vacuum formed have to be added to the cab, these were added with Glue and Glaze or canopy glue, which is basically similar to PVA, and dries quickly. 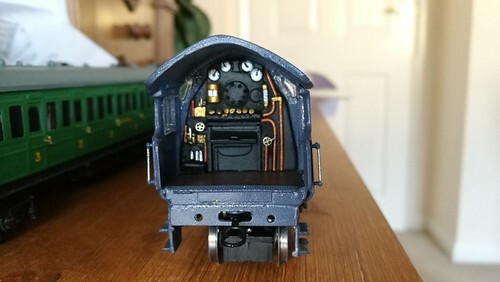 After the front and side windows have been added the more colourful and interesting item could be added, the boiler back head. 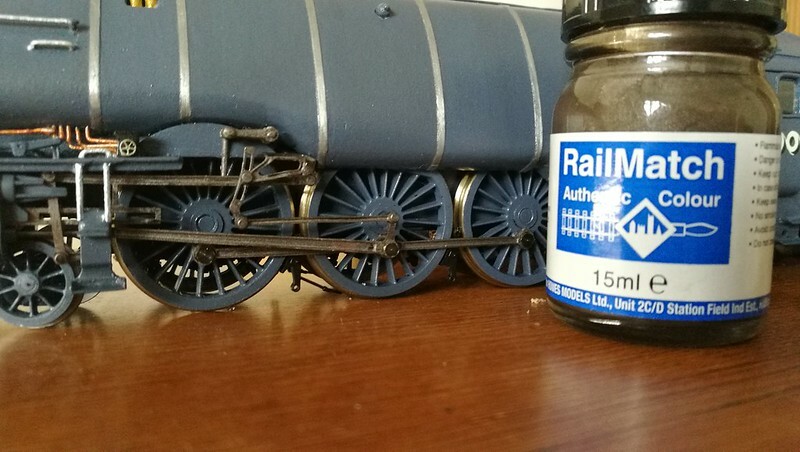 This was painted and detailed quite early in the build process, the handles were from Mainly Trains etches and brass wire. 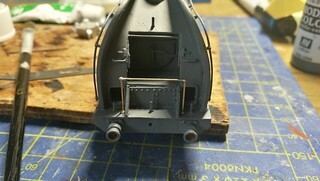 The back-head itself was painted with Halfords Matt Black spray paint, and then Vallejo acrylics paints. I hope to have the rest posted up over the weekend when I have some WiFi as I don't have internet at the moment. 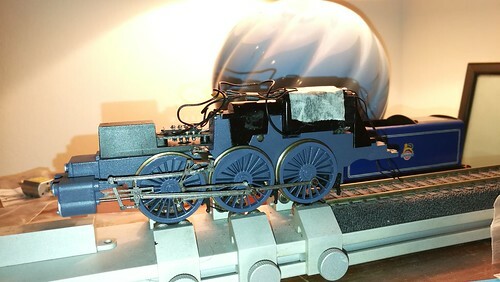 With the model back in one piece it was taken to a friend's layout, as I don't have one here, and was tested on DCC, and worked quite well but required some fettling in regards to the balance and springs being adjusted to make sure maximum tractive effort and also power pickup. 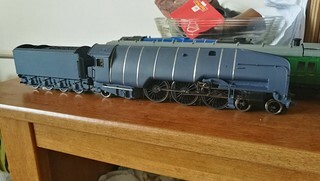 It was tested over some complex point work and checked for any stalling, it ran well around the layout and I was generally quite pleased with performance on its first run out. So that concludes this build which will be published on my new website when ever its finished. 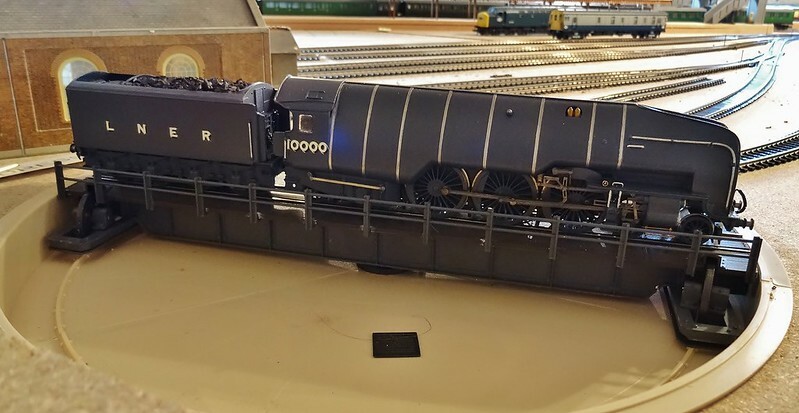 A wonderful looking loco and a great build, I'm not really familiar with the prototype being a diesel guy, but that is spot on from pictures I have seen. 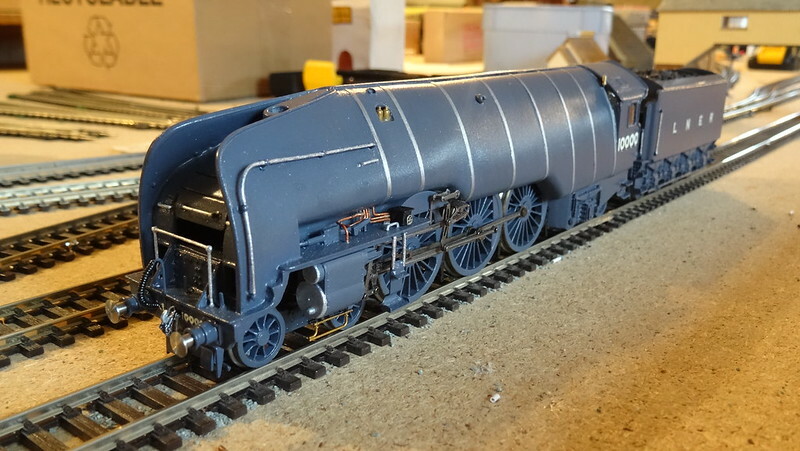 Another great loco you have produced! a fantastic end result, the details brilliant especially in the cab, i have really enjoyed watching this develop.